Restaurant”. Under Jane Baxter, the Field Kitchen’s championing of seasonal vegetables, shared dishes and an affordable set menu has turned out to be a phenomenal success. The obvious thing would be to open another restaurant further East, but cash is tight and I hate doing the obvious so we have gone into the woods, cut some ash and fashioned a giant Mongolian-style tent (yurt) and made tables and benches for 80; the Field Kitchen is coming to a field near you this summer. We are going on the road, complete with a tent-dwelling team of chefs, waiters and pot washers. We will pitch up at Freightliners City Farm in Islington from 10-20th June, Mole End Farm in Kent from 19-29th August and Bristol from 2-12th September, as well as our other sister farms, WOMAD and the Abergavenny Food Festival on the way. 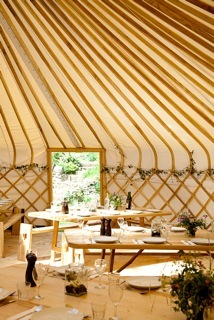 The yurt is a beautiful structure; snug with a woodburning stove for cool evenings but, with removable sides, open enough to enjoy an alfresco lunch should we get a summer. The menu will reflect what is seasonal and growing in the fields around. We are not vegetarian (though there is an option) but often convert even the most avid carnivore to the joy of vegetables. Jane describes her cooking as “gutsy and no nonsense”. Portions are generous and the service relaxed and leisurely. Bring a group of friends and book a table (10) or make up a shared table. We also hope to run cookery classes and workshops. To book, call 0845 367 1155 or 01803 762062. Our new-look website is unveiled on Wednesday 12th May. It has been designed to make it easier for you to shop and manage your account. It will also give you a better sense of where and how your veg is grown and more help with using it in the kitchen. Expect more pictures of the farm and of course plenty of recipes. We hope you find it easy to use, but if you get stuck we’ll be manning the phones for longer to help; call us on 0845 600 2311 or 01803 762059.